CITY OF RIVERSIDE: DON’T GET HOSED ON HIGHER SALES TAXES! 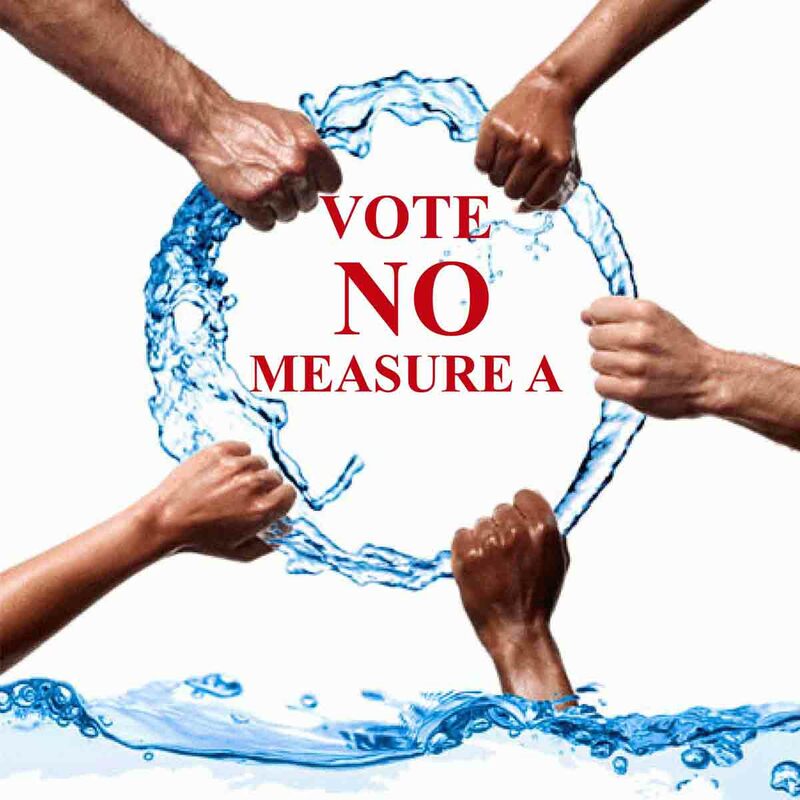 VOTE NO ON MEASURE-Z! ANOTHER NO ON MEASURE-Z VOTER? TAKE THAT TAXPAYER! Hoses, Tasers and Over Time! Yes, Police and Fire have a thing about Over Time. Overtime in the Private Sector, is unseen in any capacity, it is a reflection of incompetence within an organization (such as the City) and their inefficiency to produce an actual savings to the taxpayer, thus they continue the behavior of doing nothing about it. City of Riverside leaders have continued to make bad contract deals regarding our Fire and Police; and further, continue their practice of handing taxpayer monies to Non-Profits such as the Riverside Chamber of Commerce and The Rain Cross Group. Which if not for our taxpayer monies could not make it on their own in the market place. Transparent California shows how “high on the hog” Public Safety and Non-Public Safety Employees feed on the taxpayer trough! This informational Pamphlet on Measure-Z is simply just a subterfuge perpetrated to hide the financial mess the city is in, and the bad pension deals they negotiated. They will not cut anything, such as raises, over time and pensions, but they will make the taxpayer go without the basics, such as tree cutting. One item on both pamphlets that you should notice, because the City will lie, is that it claims Measure-Z with “Provide Anti-Drug and Gang Programs.” NOT TRUE! Anti-Drug and Gang Programs are Federally funded through Police Asset Forfeiture funds. Police have been abusing that as well, such as using these restricted funds to buy running equipment, such as shoes, for the Baker to Vegas run. This week alone two flyers went out by the Yes on Measure-Z group, sent in hopes to capture your hearts, as opposed to your mind. One on Fire, then the second on Police. Remember fellow taxpayers, huge money is behind the Yes on Measure-Z campaign. Tim Strack, President of the Riverside Fire Union has placed close to $100,000.00 against you. Sgt. Brian Smith, Riverside Police Union, is doubling down on, though he lost $350,000.00 of his member dues, through an embezzlement scheme. How can Sgt. Smith be trusted? He colluded and conspired with the Chief of Police, Sergio Diaz to remove two Councilmen who didn’t agree with them. President Sgt. Brian Smith of RPOA, was Vice President, when Chris Lanzillo was President. Remember the “Cop Play Book?” Well his mentor, Chris Lanzillo, former Riverside Police Detective is now seeing jail time according to the Press Enterprise. More to come on Chris Lanzillo and Brian Smith, you can count on this! These guys are not what they appear to be, their crooks! Even Las Vegas Developer Terry Manley, remember La Sierra Hills, is in on our local politics. Is he hoping someone at City Hall will remember him being a loyal soldier? Yes it all stinks to high heaven folks, especially to be betrayed by your City Leadership and those who took an oath to protect the Public First, Fire and Police. Some state that Police and Fire make less than Teachers, I personally find that an insult to Teachers, but Transparent California tells a different picture on Fire and Police. It seems that they are making more than Corporate Execs and Doctors! The Riverside Police Department have incredible amounts of OT (Remember that’s how they pad their pensions), Other Pay and Benefits before finally tallying up the final total. If you come from the Corporate Private Sector as I do, OT as this is never seen. Overtime as this would lead a corporation to Bankruptcy, and that may be where the City is going. It won’t, rather cut spending, we’ll just tax the residents. Private sector in the same situation, just can’t grab money from the air as the Public Sector, they have to make cuts and increase production, otherwise, bankruptcy. Currently, as stated in an August 8, 2016 Press Enterprise article, City Worker Pensions now average $71,811.00! Police and Fire average $108,173.00! 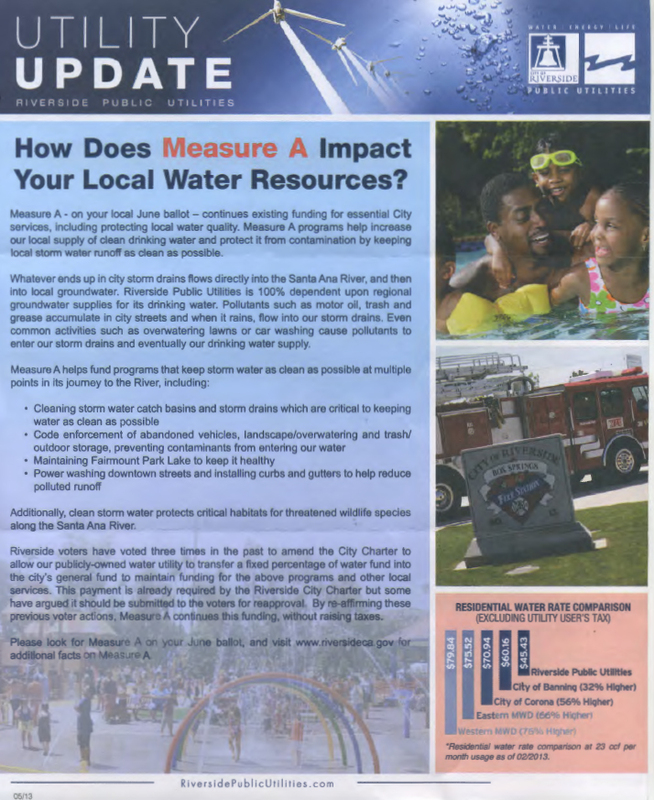 Back in 2013, the City sent out at taxpayers expense, and informational flyer, known as the Water Measure, or Measure-A. The items claimed Measure A was needed for, are the same items Measure Z is needed for! Who’s telling the truth? Certainly not the City, Police and Fire. 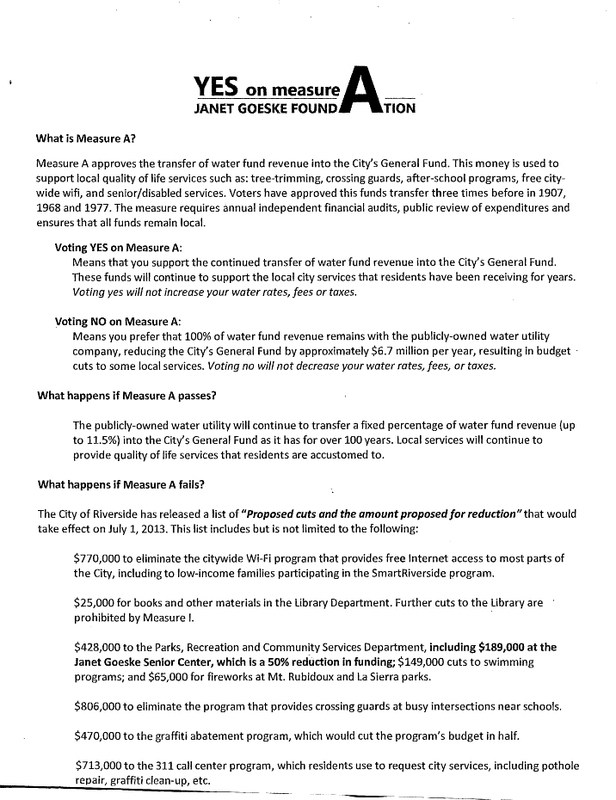 In this taxpayer paid pamphlet, the City of Riverside threatened the taxpayer, that if this Measure-A didn’t pass the following would occur: The City would be forced to cut $6.7 million in local services, there may actually as residents faced with more gangs, graffiti and rundown streets. They actually stated that 79 City positions would be eliminated which included Police Officers, Firefighters, School Crossing Guards (we know what happened there), youth recreation programs (we know what happened there), senior services. (they actually threatened the Goeske Center Seniors, that if the measure didn’t pass funding would be cut to the Goeske Center). What do I think? Talk about below the belt, City of Riverside lied and threatened the Goeske Center. If the City can’t take control of OT (Over Time- just look at it on Transparent California) and Other Pay and deal with Fire Unions to lower our debt which equals taxes, there are alternatives. In Texas, the Volunteer Fire Department in not only revered but respected, because they are literally part of the community. Let’s do it Riverside, but the leadership doesn’t have the guts as these guys do. Are we willing to be as Tough as Texas and Vote No on Measure-Z? REMEMBER MY FELLOW TAXPAYERS DON’T BURDENED YOUR BACK BY HIGHER SALES TAXES! Again what we have in the City of Riverside is “not a revenue problem” but a “spending problem.” We’ve been writing about this since 2011, and predicted the City of Riverside would be running out of money in 2016; that happened. But the City continues to spend our money on overpriced consultants and an overpriced city manager to tell them the truth. If they listen to the wingnuts, as they call us, we did it for free. Remember the Water Measure, Measure A; then they states we were going to lose fire, police, services etc. if it didn’t pass. It passed and we lost services anyway. The council, staff, fire unions, our rpd police unions lied about it. That’s a fact! To put bluntly, Measure-Z is all about sustaining the unsustainable fire and police pensions. Even if Measure-Z passed, the taxpayer would be screwed again, we still won’t get our trees cut, but we get a bike lane on Brockton no one uses. While the private sector is receiving 0.5% to 2% increases in pay, public sector is receiving 6% to 15%. All union negotiations should not be behind closed doors, but behind the watchful eye of the public. New story breaking in the Press Enterprise, here we go again, now the City wants to build a new 5,000 seat stadium next to the Convention Center at a cost of $87 million. Who’s going to pay for it, guess who? Right again through issuing a bond and increase sales taxes. UPDATE: LOOKING BACK AT A TMC POSTING ON DECEMBER 28, 2013, HISTORY REPEATS ITSELF, SCORES OF RETIRED, AND EX-FIREFIGHTERS AND EX-POLICE OFFICERS INVOLVED IN DISABILITY SCAM. According to the L.A. Times many of them were coached before going to physician’s to be evaluated by their attorneys and supported by their unions. This is the kind of behavior that concerns people in Riverside. Many of them were found going fishing, riding motorcycles, running, going on cruise and working other jobs. The let down was the taxpayer, who placed these individuals on a heroes pedestal. These individuals didn’t care, only for their own self interest at the expense of the hardworking taxpayer. More arrest eminent, the fraud has been predicted to extend beyond $400 million. Boys just want to have fun, even on a disability retirement.. In Riverside we had the case of retired and ex RPD officer Chris Lanzillo, who was given a medical retirement/pension and went on to start his own investigation firm in Orange County. Another medical/disability retirement fraud case? Lanzillo was a former Union President for RPD and somehow connected to doing work for the law firm of Lackie, Dammeier & McGill, which their offices were raided by order of the Orange County D.A. office. Since then two Costa Mesa Councilman sue the law firm and it eventually closed. UPDATE: DWP UNION CHIEF, BRIAN D’ARCY, OF THE INTERNATIONAL BROTHERHOOD OF ELECTRICAL WORKERS REFUSES TO TURN OVER FINANCIAL RECORDS OF HOW PUBLIC MONIES HAVE BEEN SPENT TO AUDITORS. Ron Nichols confided at a private meeting with the DWP Board of Commissioners that IBEW Union Boss Brian D’Arcy had made the threat, and Nichols said he was worried the City of L.A. would not defend him in a lawsuit, according to two officials who attended the meeting. Is this another example of how the Goodfellas continue to infiltrate public sector monies by strong arming and threatening public officials for their own self greedy gratifications? It is apparently appearing to be so. Alleged corruption of this magnitude should not be tolerated by the public at large. Guess who is now Los Angeles’s DWP General Manager? Former Riverside Public Utilities Crook, Dave Wright… The Trash Recycles in many ways! As all these public servants do, including Fire and Police, as in the Lanzillo case, they retire early, and double dip into a second pension. Its crooked and its fraud, TMC is simply exposing the truth.